Pork, Apple and Sage Meatloaf has all the flavors of the season in one big package. Not only a very tasty meal, but makes great leftovers too. Perfect comfort food with all the flavors of fall. Meatloaf is one of the most popular comfort foods and it is certainly mine. What I love about meatloaf is everything goes into 1 bowl, then you get in there with your hands, mix and roast. It’s the perfect easy meal because comes together really quickly and you can pretty much add any flavor combinations you like. You could create an Asian-style meatloaf using ground pork, chopped scallions, hoisin sauce, fresh ginger. Wow, I think I just discovered my next meatloaf recipe. But, in keeping with the flavors of the season I used ground pork, apple and sage and the combination is so flavorful and comforting, not much of this meatloaf survived for leftovers. It’s typical to top meatloaf with ketchup before roasting, but I didn’t want to use regular ketchup. For this meatloaf I stepped outside the ketchup box and I made an apple ketchup. You can find the recipe here (recipe). 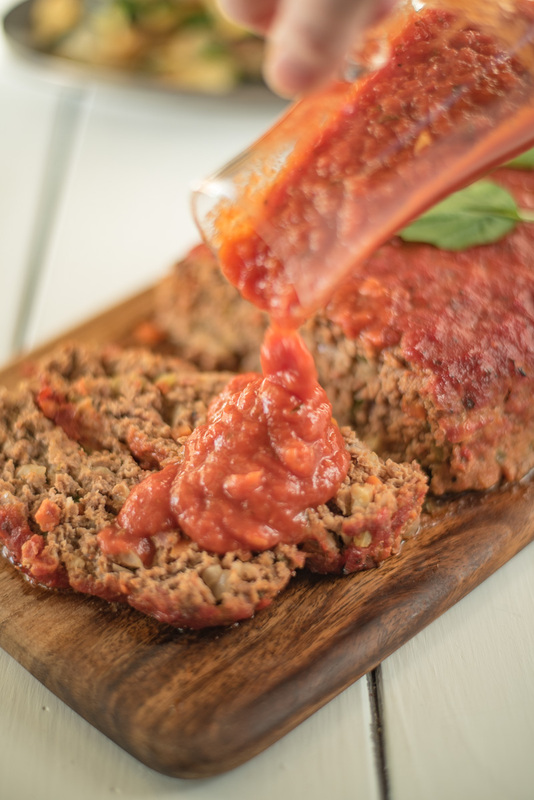 The ketchup is the perfect complement to this meatloaf and helps add a tasty crust when roasting. The ketchup also makes a great topping dipping sauce when serving the meatloaf. This pork, apple and sage meatloaf is a fantastic and inexpensive dish for entertaining on a fall evening, or for a family dinner that can be made ahead and roasted when you’re ready. I served the meatloaf with a side of sweet potato mash with chopped fresh sage and green beans. The leftover ideas for meatloaf are endless from an easy sandwich (don’t forget the apple ketchup). Toss it with pasta and vegetables, roll it up in wonton wrappers and make egg rolls, or break it up and sauté it with some potatoes to make a breakfast hash. That is, if you have any leftovers. If you’ve tried this Halloween Pumpkin Spiced Applesauce Spider Cupcakes or any other recipe on the blog then don’t forget to rate the recipe and let me know how you got on in the comments below. I love to hear from my readers! You can also FOLLOW ME on FACEBOOK, TWITTER, INSTAGRAM and PINTEREST to see daily recipe updates. 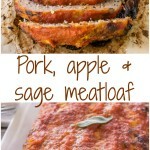 Pork, apple and sage meatloaf has all the flavors of the season in one big package. Not only a very tasty meal, but makes great leftovers too. Wrap the grated apples in a clean towel and squeeze out as much moisture as you can. THIS IS AN IMPORTANT STEP SO YOU DON'T GET SOGGY MEATLOAF. To a mixing bowl add the breadcrumbs and milk, and leave for until all the milk is soaked, about 2 minutes. After 2 minutes, to a large bowl add the ground pork, apples, onion, bread, oregano, sage, egg, salt and pepper. Mix until everything is well combined. Turn out onto the baking sheet and mold into a meatloaf shape, about 10 inches long and 5 inches wide. Top with apple ketchup. Bake for about 1 hour, or until a thermometer when inserted into the center reaches 165 degrees F.
Remove from the oven and allow to rest for 10 minutes before slicing and serving. Serve with extra apple ketchup. I made this for dinner last night, along with your fabulous apple-ketchup and it was to-die-for fantAstic. Absolutely incredible flavours. I did sautee half of the apple and fresh sage along with the onion, then put the rest of the apple/sage into the meat, uncooked, and I let the loaf marinate in the fridge pretty much all day before cooking, which I think allowed the flavours to really pop. For anyone else reading this, don’t forget to squeeze out the apples before adding them to the meat. I did forget and I had a pool surrounding my meatloaf! I did enjoy the apple catsup very much, it is worth the time to make it. These tasted wonderful the night we made them (we made 2 loafs), and even better the next day cold, on sandwiches. Substituted the apples with organic, unsweetened applesauce, and made our own apple ketchup by just mixing 2 parts ketchup with 1 part applesauce. Avoiding dairy, so substituted the egg with egg-less mayo (“Just Mayo”), and skipped the milk all-together (texture was fine without it). Our new favorite meatloaf, will be sure to have this one again and again. Thank you! PS: Needed to bake this (at 400 degrees) for 70 minutes though. Wow Ray thank you so much for the feedback. I love how you were able to customize to suit your dietary needs. OK, I made this last weekend. I’m also going to go with dried sage next time; just not used to the flavor of the fresh. I suppose all that makes it sound like we didn’t like it, it tasted very good, so I plan to try again with change. I do have to admit to being lazy and not making the “apple ketchup” recipe. Instead, I mixed ketchup with natural applesauce and spread that on top of the meatloaf. Not sure how it compares to the real thing, but it tasted pretty good to us. 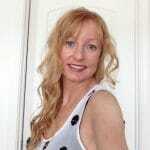 Hi Rebecca, thank you so much for your feedback. I understand your issue with the sage. I love your idea of the quick apple ketchup and it’s very smart of you to adapt the recipe to your own preferences. I hope you enjoy it the next time because the way we all taste food is a personal thing and we all should enjoy what we eat. Thanks again. G’day Your meatloaf looks delish! Wish I could try some now! What a beautiful meatloaf for fall! And the apple ketchup is the absolute perfect accompaniment! This is the perfect Fall meatloaf! Gorgeous photos too! Absolutely gorgeous photos and the recipe is terrific. Must try this. I can almost taste this with that beautiful sweet potato mash. A great reminder to make something like this this winter, Janette! I can imagine how wonderful it would taste covered in a tasty gravy … mmmm! I love meatloaf and this seasonal version looks amazing! Great and wonderful idea to incorporate apples and pumpkin in it! Looks delicious Janette!! Meatloaf is such a wonderful comfort food and I definitely want to try your recipe…the flavor combination sounds fantastic! LOVE the flavors in this meatloaf, wow!! !